Barbra Streisand is a legendary American singer and actress. Additionally, she is also a songwriter and a filmmaker. What stands her out is that, unlike other artists who only excel in one field of entertainment, she has excelled in both acting and music. As an actress, Streisand starred in, directed, wrote, and produced several highly acclaimed movies. For this, she won several accolades including an Oscar for best actress and a Golden Globe Award for best director. Barbra Streisand (original name Barbara Joan Streisand) was born on the 24th of April 1942 in Brooklyn, New York. Her parents, Diana and Emanuel, were Jews and she has an older brother named Sheldon. She also has a younger half-sister named Roslyn Kind. Streisand’s dad died shortly after her first birthday and she and her family endured some tough times. Barbra Streisand had her education in various public schools located in Brooklyn. As a child, she was blessed with a beautiful voice and she sang at public functions such as weddings. Despite her talent, she did not aspire to be a singer. Rather, she aspired to become an actress like the movie stars she saw on TV. Upon graduating from high school in 1959, Barbra Streisand immediately pursued a career in acting. She, however, found it difficult landing roles and did various menial jobs to survive. During one audition where she was required to sing, the casting director advised her to explore singing since she was quite talented at it. She took the advice and immediately set to work and produced demos. She also took part in a singing contest held at a Manhattan gay club and emerged the winner. This was in 1960. Afterward, she started performing at various upscale clubs in Manhattan. Barbra Streisand caught a well-deserved break in 1962 when she landed a role in the Broadway musical, I Can Get it For You Wholesale. She gave such an awesome performance that she received a Tony Award nomination for Best Supporting Actress. This made her an instant celebrity and she was featured in several TV shows. Streisand released her first album, the Barbra Streisand Album, in 1963. The album made it to the top ten on Billboard album charts and won her three Grammys. She did not rest on her oars but instead followed it up with her iconic role as Fanny Brice in the 1964 musical, Funny Girl. Her performance earned her a Tony Award nomination for Best Leading Actress. In the 1960s and 70s, the Brooklyn native diversified to the big screen with tremendous success. Some of her movies include Funny Girl, Funny Lady, A Star is Born, The Way We Were, The Mirror Has Two Faces, The Prince of Tides, and The Guilt Trip. In 1983, Streisand co-wrote, co-produced, and directed the movie Yentl. The movie, which is about a woman who pretends to be a man in order to continue her studies, featured Streisand in the lead role. It won the Golden Globe Award for Best Motion Picture Musical and Best Director. Streisand is the first and only woman till date to win the Golden Globe award for Best Director. Barbra Streisand is one of the richest self-made women in America. This is not surprising given the brilliant career she has had. Forbes estimates her net worth be as much as $400 million. She made the bulk of her money from showbiz – music, movies, and theatre. Once upon a time, she was the highest paid concert performer in the world (this was in 1994). Her 1994 concert was also the highest grossing concert of the year. Streisand has won numerous awards for her works. She has been nominated for the Grammys 40 times but only won 8. She was given the Grammy legend award in 1992 and in 1994, she was given the Grammy lifetime achievement award. Streisand received France’s Legion of Honour in 2007 and the Presidential Medal of Freedom in 2015. Additionally, she was made a Kennedy Centre honouree in 2008. Streisand has been married twice in her life. Her first marriage was to actor Elliot Gould in 1963. They met and fell in love whilst both featuring in the Broadway musical, I Can Get It For You Wholesale. The marriage produced a son named Jason Gould who was born on the 29th of December 1966. The couple separated in 1969 and divorced in July 1971. The Funny Girl actress is presently married to another actor. 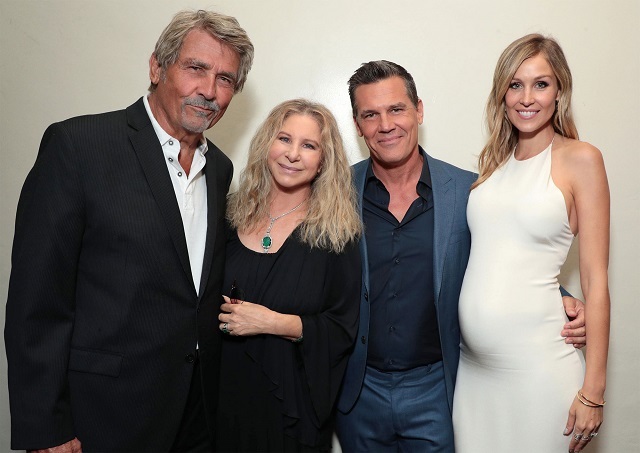 His name is James Brolin and they got married on the 1st of July 1998. Barbra Streisand has only one child, and that child is from her first marriage. His name is Jason Gould. He followed his parent’s footsteps into the movie business, albeit with lesser success. Jason is openly gay. See Also: Tony Bennett Bio, Wife or Spouse, How Much Is He Worth? The actress has an ageless beauty and youthful looks. This has made many to speculate that she has had some work done. Barbra Streisand is not one of those celebrities who are open about going under the knife to improve their looks. However, cosmetic surgery experts have analyzed her photos and come to the conclusion that she has had some procedures. They list them as dermal fillings, a mild nose job, Botox injections in her lips, radio frequency skin treatment, as well as a bust augmentation.